The main sample images gallery page was getting too large, so I have created a new Images Gallery menu that allows selection of sample images galleries by gear type (such as Canon Zoom Lens Sample Pictures). By request, I have modified the image galleries to be able to show more gear (tripod, tripod head, filters, extenders ...) specifically used for each image. And by more-specific request, the American Southwest Gallery has been updated with this gear. I don't know if I will get time to retroactively update other images on the site, but I will add this information to all new images. B&H has the Kirk SGH-1 Super Grip Handle in stock. I know some of you were looking for something like this and wanted to make you aware of it. Looks like a great way to securely carry a big lens - or even a camera. Might even make a decent ground pod in the right conditions. A new specification, 47.25" x 31.5" (1200mm x 800mm) Subject Framing Distance, has been added to the Lens Specifications and Measurements Tool. This is the laser measured distance from the camera sensor plane to a subject framed the specified size at the specified focal length. Use these values to compare lenses or to determine if a lens will meet your needs. Most Canon and Nikon lenses and many other third party lenses have this information included in the database. Canon EOS 60D Coming This Fall? I would not be surprised to see a Canon EOS 60D arrive this fall, but DxO Labs is apparently sure enough to publish the it. Update: Now Removed: The Canon EOS 60D is listed on the DxO Optics Modules Roadmap for inclusion in November. I caution against making plans based on unsubstantiated rumors, but thought you might find this interesting. Canon typically makes new DSLR-related gear announcements in August. Permalink: Canon EOS 60D Coming This Fall? ISO 12233 Resolution Chart and Lens Specifications and Measurements Tools have been added to the Tokina 11-16mm f/2.8 AT-X Pro DX Lens page. I added a Packing for a Landscape Photography Trip page to the tips section of the site. Posting the American Southwest Photo Gallery generated some interest in what gear I took with me, so I'm sharing this along with the American Southest Grand Tour itinerary I followed. ISO 12233 Resolution Chart, Lens Specifications and Measurements and Standard Product Image Tools have been added to the Sigma 17-70mm f/2.8-4 DC Macro OS Lens Review page. Canon has introduced an EOS Rebel T1i instant rebate. The rebate amount is $100.00 for the body with the EF-S 18-55mm IS lens and $150.00 if the Canon EF 75-300mm f/4-5.6 III Lens is purchased at the same time. Swap the 75-300mm lens for the EF-S 55-250mm f/4-5.6 IS Lens and the instant rebate increases to $200.00. The rebate period runs through July 31st, 2010. 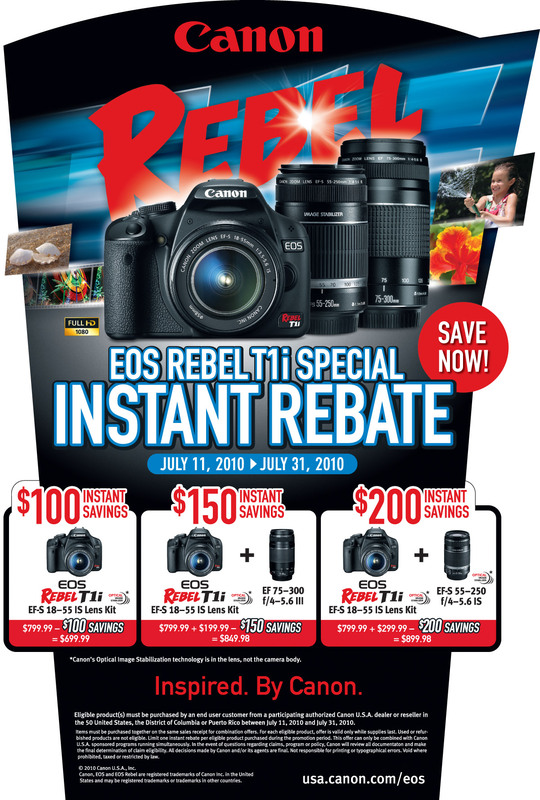 The Canon EOS Rebel T1i July 2010 Instant Rebate Form is available for download. Here are the Rebel T1i DSLRs at B&H. Canon has released EOS 7D Firmware Version 1.2.2. Firmware Version 1.2.2 incorporates the following fixes. 1. Fixes a phenomenon in which the set aperture moves when shooting movies in manual exposure mode using some Canon lenses (such as macro lenses). In this gallery, I share some of my favorite images from my recent American Southwest "Grand Tour" trip. Of course, camera and lens settings are included along with some commentary and tips. I increased the size of the photos in this gallery relative to what I have been posting. Please let me know if the larger size causes you problems - and remember that "CTRL-" and "CTRL+" decreases and increases viewing sizes in most browsers. Canon USA as announced new PIXMA Printers and CanoScan LiDE Color Image Scanners (press release). The printer press release headline reads "NEW FULL HD MOVIE PRINT FEATURED IN FIVE NEW CANON PIXMA PRINTERS". The movie print feature allow selection of a specific movie frame for printing. A useful feature for smaller prints. Read the press release for more details. Maeda commented that a smaller camera does not necessarily mean mirrorless. ISO 12233 Resolution Chart Crops have been added to the Tamron 10-24mm f/3.5-4.5 DI II Lens Review page. The Tamron 10-24mm f/3.5-4.5 DI II Lens and I are off to a rocky start. The first copy backfocused at all focal lengths. The second copy backfocused at 24mm. And by backfocusing, I'm talking about the lens focusing behind the subject by an unacceptable amount (not just a tiny distance) on both a 50D and a Rebel T2i. The third purchased-retail lens appears to be focusing accurately. I have added ISO 12233 Chart results from the last two lenses (select the specific lens results to view using the drop-down box) - I was hoping the wide open results from the first-tested lens were an anomaly, but ... they apparently were not. You will not want to use this lens wide open very often. THK Photo Products has announced the HOYA PRO1 Digital ND16 Filter (press release).